"Charting the WORD for the CHURCH"
Noah Said "My Didn't It Rain"
This book is the outgrowth of studies and sermons over a long period of time, under different titles. In the life and ministry of these two prophets there are so many rich experi­ences, all applicable to us today and to the church down thru the centuries; therefore the Title, "PROFIT FROM THE PROPHETS," seemed appropriate. It is very probable that Book No. 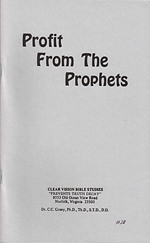 2 of "PROFIT FROM THE PROPHETS" will be off the press sometime in 1984; every one of the Prophets has a wealth of teachings beneficial to the Body of Christ. Elijah was without question among the greatest of God's servants, and his appearance on the Mount of transfiguration (Luke 9:30 etc.) with Christ and Moses, and the promise of him returning to earth again "before that great and dreadful day of the Lord," give great prestige to his position in the plan of God. Elisha, on the other hand, figured in more miracles over a longer period of time than did Elijah or any other prophet. His request at the rapture of Elijah "for a double portion of Elijah's spirit" was answered, at least in part, by him performing "double" the number of miracles Elijah performed. Elisha was the human factor in 12 recorded miracles while Elijah had only 6 in his ministry. So we commend "PROFIT FROM THE PROPHETS" to you, only asking that you use ALL the "PROFIT" to the GLORY OF OUR MASTER JESUS CHRIST.